As a tethered host-powered device, the NetBlazer offers four network interfaces standard for anywhere-anytime flexibility. The integral USB port “appears” as an Ethernet interface to standard hosts. The wired 10/100 Ethernet port can be used for network access or to support a VOIP hard-phone. Integrated 802.11 Wi-Fi allows you to create your own personal and secure hot spot while the Wi-Fi client permits simultaneous uplink to a Wi-Fi network provider. Of course, all interfaces can be used at the same time with the secure tunnel over any port. 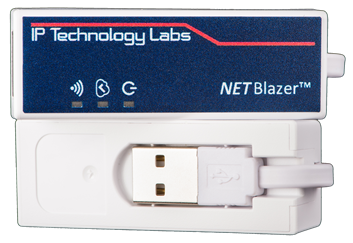 Built on IpTL’s product-based converged infrastructure technologies, such as the Model 71, Model 75, and Model 79R, the NetBlazer solution provides the same network connectivity, application transparency, and tunnel security without the individual hardware overhead, maintenance, and costs of a separate hardware installation.